George A. Bergwall Arena is located at 306 Pioneer Road in Red Wing, MN and is adjacently connected to the Minnesota Southeast Technical College. Upon our visit to this southern Minnesota town, we found out that the city "recently had sold the building back to the State/College, and the aging 1980's erected building is slated to be demolished for future advancements to the College campus". The walkway to the arena, peeling paint, and roof of the building are extremely poor and shown signs of water damage (See photos of the bags draped from the ceiling to "collect" rainwater). For several years, the Red Wing School District was in financial turmoil and in February of 2015, the board approved $1.6 million in budget cuts. 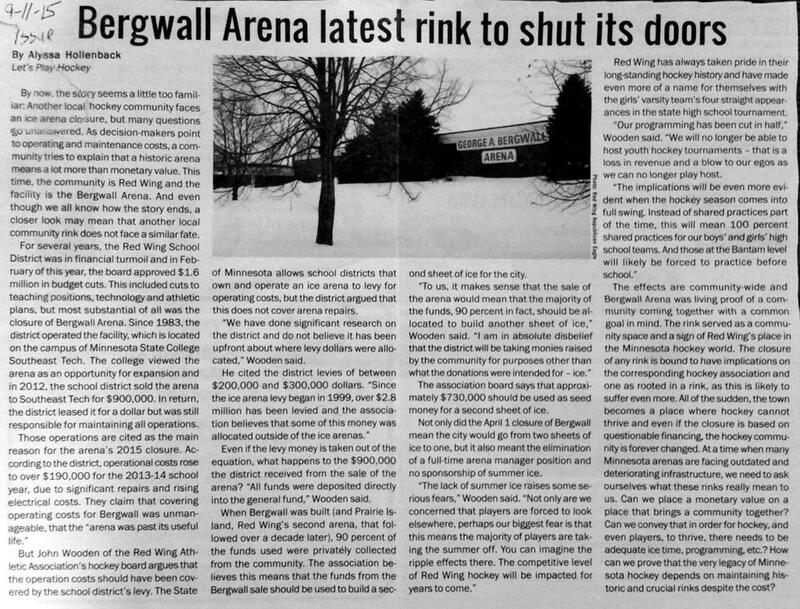 The cuts included cuts to teaching positions, technology and athletic plans - but most substantial of all was the closure of Bergwall Arena. Since 1983, the district operated the facility, and while sitting on the Minnesota State Southwest Campus, the college viewed the aging building as an opportunity for expansion. In 2012, the school district sold the arena to Southwest College for $900,000, and in return the district leased it for a dollar but was still responsible for maintaining all building operations - those operations were the main reason for the April 1, 2015 closure due to escalating costs and repairs needed to "covering operational costs for Bergwall was unmanageable, that the arena was past it's useful life". said John Wooden of Red Wing Athletic Association Hockey Board. Not only did the April 2015 closure of Bergwall mean the city would go from two sheets of ice to one, it also meant the elimination of a full-time arena manager position and no sponsorship of summer ice with the closure leading to ripple effects, and a worry about the competitive level of Winger hockey in history rich Red Wings' hockey program. George A. Bergwall Arena was dedicated to George himself on February 20, 1983 posthumously in honor of his "tireless energies and many talents and his devotion to enriching the lives for the Red Wing Community". George, a Hamline University Graduate in 1947, moved to Red Wing in 1956 with his wife Joan "Hap" Bergwall and 5 children where he was employed at Red Wing shoe company. A member of Hamline Universities Athletic Hall of Fame, George remained an active part of youth sports serving on the YMCA Board of Directors within Red Wing, he sadly passed away from complications of ALS in 1981. We were very happy to have visited the arena prior to it meeting the wrecking ball - as this was the only arena within historic Red Wing for many years until the newer Prairie Island Arena was erected in 1999, which lies next to the Red Wing High School for the "Wingers" hockey program. Special thanks to Southeast Technical College staff for allowing us access to the Arena to capture the images shown.